Welcome back for part two of my summary of the Mozilla Tech Weekend. On Sunday, November 29th, we organized some workshops as an hands-on part for some of the topics of the tech talks we did on day 1. In particular this resulted in a session on Hacking Addons for Firefox OS and a second session about starting with Servo and Rust. We did not really advertise these workshops in advance as our Berlin Mozilla Community in still in its baby shoes and we wanted to make sure that everyone who participated was taken care of. Luckily the snow was gone and we opened doors at 11 a.m. as we did on the day before, this time in the Mozilla Office. Being a Sunday morning it took some time to get started. After some coffee we started around 11:30 a.m. with the Firefox OS Addons session. Michael Henretty showed how to write a first addon and helped along the way. Just give it a try, it's really not that hard to get started. After some time and lunch we continued with our second session covering an introduction into Servo and Rust by Till Schneidereit. We helped each other setting up a development environment for servo and Till provided us with an overview about the project. In the afternoon, around 4 p.m. we started to break up. We were having some nice conversations while gathering our things and trying to finally depart which takes quite some time when you don't want to stop talking. I hope we see each other again early next year. 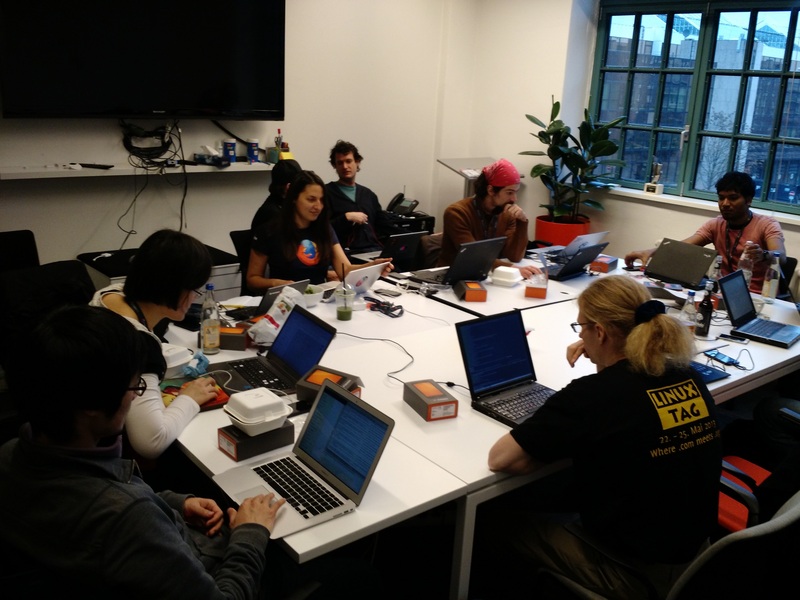 Hopefully some of you at our next Berlin Mozilla Community Meeting. That's it for now. If you want to check out the recordings of the talks.